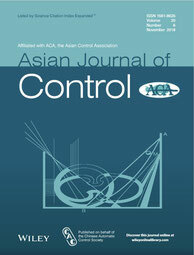 The Asian Journal of Control, an Asian Control Association (ACA) and Chinese Automatic Control Society (CACS) affiliated journal, is the first international journal originating from the Asia Pacific region. The Asian Journal of Control publishes papers on original theoretical and practical research and developments in the areas of control, involving all facets of control theory and its application. Published six times a year, the Journal aims to be a key platform for control communities throughout the world. Control system, electronic, electrical, mechanical, sensor, process, chemical, biomedical, automation, and instrumentation engineers; researchers in advanced control systems and signal processing; mathematicians; computer scientists; operational researchers; economists. Robust, optimal control, stochastic control, nonlinear control, adaptive control, neural networks, parameter estimation, system fault detection, artificial intelligence, fuzzy and expert systems, hierarchical and man-machine systems, robotics, data processing, mechatronics, control applications, journal, online journal, Wiley Online Library.